This is the first time we’ve made one of Tom Colicchio’s recipes on 2frugalfoodies. We checked out his cookbook sometime last year and thoroughly enjoyed it, learning a lot with every page we turned. One interesting piece of advice he gave is to center your meal planning around fresh vegetables/starches/fruit and then chose the protein after that. We have much to learn and I still stand by the statement we made early on in the blog that we don’t have the credentials to clean Tom Colicchio’s knives for him. In any case, this was an exciting and delicious recipe to make. We found short-ribs on sale at the grocery store and pounced on them. This is our first try with beef short ribs, and it won’t be our last. Mary Katherine described it as similar to a beef version of pulled pork, but with its own remarkable taste and setting. 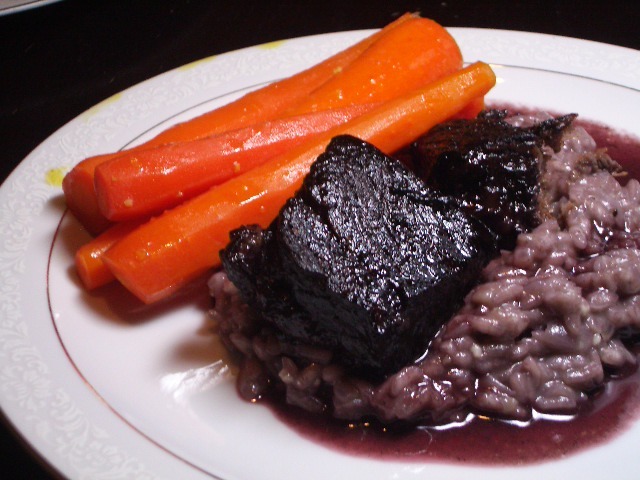 To accompany this dish, we made a red wine risotto with the rest of the red wine that isn’t used in the recipe and also made some glazed carrots. It all went together so well, especially with a hearty spoonful of the braising liquid on top of everything right before serving.